Summer has come and gone, and the crisp autumn air of September is finally here. Soon the skies will adorn the flighted ones making their long voyage home. And not just the flighted ones, but the hoofed ones, the swimmed ones, and everything in between. Anishinabek people are migratory people too. According to oral herstory (history) we migrated from the East Coast and travelled inland, and continued to do so all the way until the Rocky Mountains. Our migratory patterns did not end there, as we continued to be a “moving” people. We always moved with the changing seasons, from our summer camps, to our winter camps, year in and year out. With the implementation of the Indian Act, Indian Reservations, and Residential Schools, our migratory patterns were essentially outlawed, thus drastically altering our way of life forever. We were prohibited from any of our cultural practices, ceremonies, languages and from ever leaving the Reservation. As time wore on, and as we became more “Christianized, “civilized” and “assimilated”, some of those rules and laws within the Indian Act became less necessary to enforce. Eventually we no longer required permission to leave the reservations, and are now free to come and go as we please. Anishinabek people have taken on new forms of migration. We no longer migrate in search of abundant fishing waters, or in search of big game. But we still migrate in search of sustenance. For starters there is Pow-Wow season. Each and every year, thousand of dancers, drummers, singers, vendors travel long distances in search of “cash prizes” and “honorariums”. For some people its not about the money, but its merely their only exposure to anything “Native”. Whatever peoples reasons, financial, cultural or otherwise, its about sustenance. The most common form of migration known to Anishinabek peoples, is the migration away from reserves and into urban centres. On many reserves (including my own) the traditional way of life is non existent, and economic opportunity is based on “how many family members sit on Chief and Council”. People are forced to either fight amongst each other over the few positions at the Band Office, collect welfare cheques, or to leave the reservation entirely. Growing up in foster home, my sister and I had limited access to our biological father who lived 1km down the road. Each and every single year he would make one of these “seasonal migrations” looking for work, and we’d be left wondering if we’d ever see him again. For many years as a youth, I would cry myself to sleep, alone in my bed wondering if we would ever feel the warmth of his hugs again. When the fall came, he left whatever farm he was working on, and would return home, and if we were lucky the visitations would continue. When I was 15, my father made one of these “migrations” to Toronto and never returned. My dream of the 3 of us being a family once again died, when he died. I was 19. After the death of my father, I made my own migration away from the reserve and into the metropolis of Toronto. I have been migrating to and emigrating from city to city, all across Turtle Island (Canada). For the most part I have been running. I’ve been running away from myself. Unable to cope with drug/alcohol addictions or past unresolved issues. For many years I had been on the run. Running away from everything. That was until I decided that I wasn’t going to run anymore, and that I was going to sober up. It was a miracle, that Elder Vern scooped me up, and under his tutelage I began the process of biiskaabiiyaang (decolonization). One time I found myself seeking the wisdom and guidance of an Elder in BC. I had told him of many profound visions that I had been having. After much discussions and interpretations, he told me, that “I must return home, and return to my people.” So I made the migration back to the east side of the continent. When I got back to Toronto, I soon discovered that my “people” were in the process of “surrendering” all the lands within the Coldwater Narrows Land Claim Settlement for $307 million dollars. 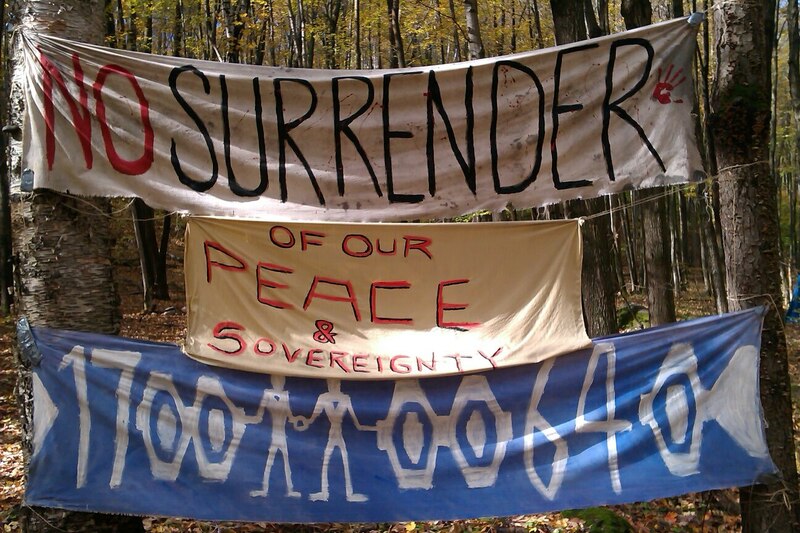 When I conceptualized the thought of “surrendering all lands forever” and what that mean to Anishinabek people. I made a conscious decision to migrate back to the land in question. Oshkimaadziig Unity Camp was born. Oshkimaadziig Unity Camp maybe just a cabin in the bush, beside a big rock with some “controversial” inscriptions on it, but the camp itself serves as an entry point to begin this “migration” back to the land. At least for me it does. With the onset of fall already here, I am often reminded of the nostalgia of my father when he would return to the rez. There won’t be any return of my father this year or any other year. But perhaps someday, there will be a great migration of Anishinabek people back to our lands, like our people once lived. Perhaps it might not be this year, or it might not be next year. Perhaps it may never happen. But Oshkimaadziig must exist, and continue to prepare like our people will return. It is what sustains me.